CURRENT ISSUE COVER STORY: Medicinal marijuana market, with $1B in potential sales, is heating up in B.C. and Ontario. The federal government is making investments totalling over $2.5 million in a pair of programs at the Vineland Research and Innovation Centre. 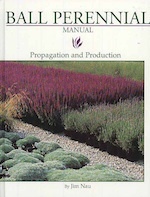 Written by Jim Nau, author of the popular Ball Culture Guide, this "cultural cookbook" on herbaceous perennials contains valuable information on 149 genera and 300 species of plants. Years of field trials at the Ball Seed Co. gardens outside of Chicago have given Jim historical data on the performance of these crops. John Clement Fisher, greenhouse vegetable specialist from 1971-90 with the Ontario Ministry of Agriculture and Food, passed away on July 23 of this year at age 88. WEB EXCLUSIVE: New research from the University of Southampton is aiming to reduce the water footprint and increase shelf life of potted and cut herb production in the U.K.
To improve the consistency and effectiveness of the U.S.-Canada Greenhouse Certification Program (GCP), APHIS Plant Protection and Quarantine (PPQ) and the Canadian Food Inspection Agency (CFIA) are revising the program requirements.